The Prime Minister told a Likud faction meeting Monday that Israel will not apologize to Turkey over the Mavi Marmara incident. 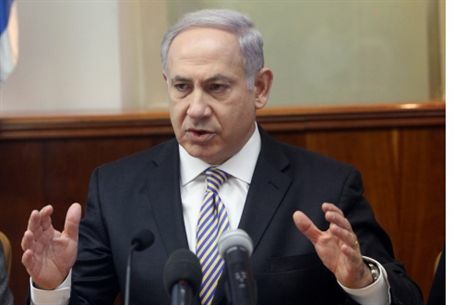 Prime Minister Binyamin Netanyahu reiterated at a Likud faction meeting on Monday that Israel would not apologize to Turkey over the deaths of nine terror activists aboard the Mavi Marmara flotilla vessel on May 31. Meanwhile, a Knesset committee of parliamentary faction leaders, headed by Knesset Speaker Reuven Rivlin, approved a motion to hold a full plenum hearing regarding Ankara’s demand. Netanyahu was responding to a question from MK Danny Danon (Likud) about media rumors that Israel would express regret over the incident in which the terror activists, eight of whom were Turkish nationals, attacked IDF commandos when they boarded the ship to guide it to the port of Ashdod. The Turkish-sponsored vessel was one of six in a flotilla that had attempted to break Israel’s maritime blockade of Gaza. Turkey’s Prime Minister Tayyip Recep Erdogan demanded after the incident that Israel apologize and compensate the families of the dead. In recent days, there were rumors the Jewish State was reconsidering its refusal to do so, and might also be willing to pay a sum in compensation to the families of the slain terror activists. Israeli and Turkish officials met a week ago in Geneva in an effort to find a way out of the diplomatic quagmire in which the two nations currently find themselves. Turkey sent two firefighting aircraft to assist the Jewish State in response to an appeal by Netanyahu to the international community for assistance when a wildfire struck the northern region more than a week ago, leaving 43 dead and ravaging some 12,500 acres of forest land.